We are welcoming it with a few wines open this Friday. Come to taste: a Syrah from the South of France, a red blend from Spain (Petit Verdot and Tannat grapes)and a white Verdejo from Spain! We would like to announce our Spirit tasting season, Starting on October 6th until the end of year, we will taste local NY spirits every Saturday!! It all happens in Roquemaure, France where the Leperchois family has been producing wines for centuries under the Lunar Apoge brand. In 1977, Christian Leperchois became a pioneer in his region by converting the estate to a fully organic/biodynamic process. His wine and the winery are certified 100% organic and biodynamic by the Demeter Group, the largest certification group in the world. Mindful of all natural and its surrounding influences, the inspiration for the winemaker’s vineyards is taken from the rhythms of our ancestors. Autumn announces the arrival of the vines’ dormant period. This is the moment for improving the soil by spreading annually composted grape pomace, which is then plowed in thoroughly and forms a protective blanket at the base of the vines. The vines are pruned vigorously to select the best fruit. Old, inactive vines are removed and burned to prevent the possibility of disease. Spring ploughing starts with the arrival of bud burst. Manual hoeing is a necessity around the vines themselves. The first shoots mark the start of manual disbudding. Early selection of the best shoots – before the growing season is fully under way – helps to ensure the quality of the grapes at harvest time. The viticultural protective cycle comes into play in the fight against mildew. By closely monitoring the vines on a daily basis, keeping an attentive eye on the weather and interpreting climatic factors, the number of treatments by dusting or spraying with naturally antifungal copper or sulphur can be kept to a minimum. During the summer, vines bearing too much fruit will have their clusters thinned out by hand. The heat of the summer and the dry Mediterranean climate are guarantees of grape maturity and concentration of anthocyans and tannins – the natural treasures produced by the fruit. Finally, we come to harvest time, with its celebrations, hopes and eagerness to do justice to a juice brimming with terroir, grape variety, color and fragrance. The cellar turns into a bustling scene of activity in which the harvest’s ‘wild’, or natural, yeasts are left to develop. In their cellar, traditional methods are used to foster the most natural and complete embodiment of the fruits of the vine – the product of outstanding soils and the passion of the men and women who toil there. 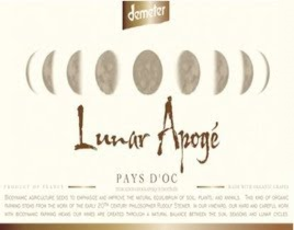 Made from 100% Syrah this 100% estate grown wine on a south-facing plot featuring their terroir’s most sandy soils; farmed biodynamically and named Lunar Apogé because of the estates dedication to their biodynamic practices and nocturnal harvest. The winemaker Christian Leperchois decides to do an all night harvest to help prevent oxidation. Fermentation is completed in temperature-controlled vats using natural yeasts to preserve primary aromas. It is whole berry fermentation but with no carbonic maceration. Domaine de Carabiniers, where this wine is made, is fully certified in biodynamic practices, and they have included their certification on their label. The winery adheres to a holistic approach in winemaking — treating its land, living species and solar system as one integral part. They are dedicated to the environment, and their Syrah is produced without any pesticides or additives. The limestone soil helps maintain low yields, creating wine with immense aromatic depth and long finish. Notes of bright cherry and a hint of dried fruit – such as currants and sultanas – are complemented by mineral backbone. A little time in the glass helps coax out more aroma. The velvety texture guarantees you’ll be going back for another glass! Made from 90% Petit Verdot, 10% Tannat from Aragon (Calatayud region) from 10 year old vines which are farmed sustainably and with low-intervention viticultural methods. This wine is fermented with indigenous yeasts and in stainless steel vats. It has a maceration time of 2-5 days. The wine is racked from the original vat to another, where it ages for 20 days with its lees. Then it is aged for 10 months in French oak, around 40% of which is new. They are fined without the use of animal protein and are therefore Vegan-Friendly. Balnea’s vineyards are located in La Seca, in the south of Valladolid, on a high altitude 2,400 foot plateau, where the soil’s low fertility and scarcity of rain combine to produce low yields but highly concentrated grapes. The soil is rich in limestone with a gravel sublayer beneath. Winemaker is Maria Jesus de la Hoz Montsalve, who is an engineer by training and is the 3rd generation winemaker at Balnea. Balnea makes only Estate wine. At 6 Ton/ Ha the yields are below the usual in the appellation.